This battery-powered Snow Joe has an 18-inch clearing width and comes with electric start. It also has a headlight. 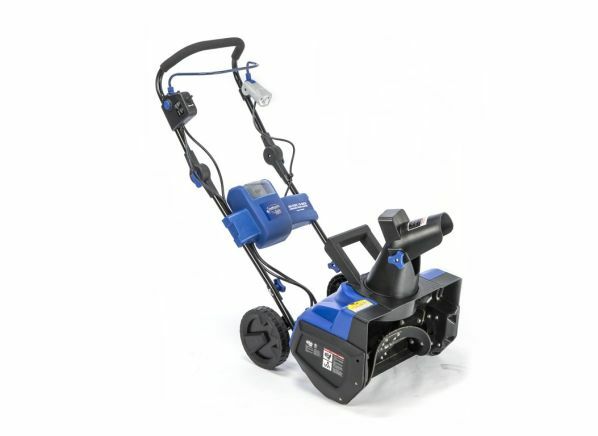 The Snow Joe iON18SB is part of the Snow blower test program at Consumer Reports. In our lab tests, Snow blower models like the iON18SB are rated on multiple criteria, such as those listed below. Width: The snow blower's clearing width, or swath, in inches. Removal speed: How quickly models could remove snow without laboring; We push single-stage machines as quickly as possible before the machine labors. Plow pile removal: How quickly the snow thrower can remove a simulated pile of snow left by a municipal plow at the end of a driveway. Engine size Engine size The engine displacement, measured in cubic centimeters for gasoline powered engines. Most manufacturers no longer give a horsepower rating, so engine displacement is now the only universal way to compare relative engine size. Electric motors are stated in amps. Electric start Electric start Most models offer a plug-in starting device that saves you the hassle of pull-starting the engine, but you need to be near an outlet. Multiple speeds Multiple speeds For two-stage models, most come with multiple forward speeds and two reverse speeds. The ability to vary ground speed according to snow conditions gets the job done faster. Some of the least expensive two-stage models have only one forward speed. Single hand controls Single hand controls Most two-stage models have individual lever controls on each side of the handlebar: one engaging the wheel traction, and the other for engaging the auger/impeller. This feature lets you hold down both control levers with one hand, leaving the other hand free to adjust the chute controls. Freewheel steering Freewheel steering For two-stage models, this feature--which usually consists of triggers under each handlebar--disengages either or both the left and right drive wheels for easy, sharp turning. Single lever chute adjustment Single lever chute adjustment Only on two-stage models, a single lever or "joystick" on the control panel allows for quick changes to the horizontal discharge direction (the alternative is a hand crank) and to the vertical discharge height (the alternative is leaving the operator position and adjusting manually), all with a single lever. Headlight Headlight Eases snow throwing at night or in low-light situations. Heated handgrips Heated handgrips While they're inessential and don't replace a good pair of gloves, they're handy for keeping up blood circulation in your hands. Warranty (yrs.) Warranty Manufacturer's stated warranty in years of coverage. In most cases it applies only to consumer use and not commercial use. Engine type Engine type Either a gasoline-powered, four-cycle engine; a gasoline-powered, two-cycle engine (now rare), or an electric motor. All electric motors are 120V AC-powered.